A secret cancer so dangerous it could only lead to a complete collapse of our nation's currency — triggering what could be the worst financial crisis any country has ever known. This man dedicated the rest of his life to warning people about what was happening. He wrote books. He held workshops and seminars. And he was interviewed by newspapers and television stations of the day. He even researched and discovered the means to reverse the damage — to save the dollar before it collapsed and return the wealth to the people from whom it had been stolen. But unfortunately, he wasn't successful. Despite all his efforts, most people never heard of him. And many of those who did found his claims so outrageous... so unimaginable... that it was easy for the government to discredit him as "just another crackpot." However, many of his dire predictions are now coming true. And the stage is set for his darkest prediction of all. Long before Ron Paul captured headlines for questioning the soundness and sanity of our Federal Reserve, Merrill Jenkins was exposing the Fed's darkest secrets to the American public. But just who was Merrill Jenkins? In a nutshell, Merrill M.E. Jenkins, Sr. was the original monetary realist. A brilliant scientist and inventor, Merrill Jenkins had spent more than 20 years creating electromechanical devices that enabled vending machines to detect — and reject — counterfeit coins and paper money. Suddenly, counterfeit U.S. coins and paper money were all over the place. And while that was disturbing in itself, it was nothing compared to the shocking identity of the counterfeiters. Because it turned out the counterfeit coins were being produced by none other than the U.S. government! Wealth Alerts from Personal Liberty Digest™. Your personal information is as important to us as it is to you. We will never rent, sell or trade your personal information with anyone. You may opt-out of alerts from Personal Liberty Digest™ at any time. You see, up until 1965 most U.S. coins were silver. Dollars, halfdollars, quarters and dimes were all struck in 90% silver. But this all changed when President Johnson signed the Coinage Act of 1965. After that, the mint began issuing what is called "clad coinage" — coins that have a core of one metal and an outer layer of another metal. To the eye, the coins looked the same. But suddenly, half dollars contained only 40% silver... while dimes and quarters contained no silver at all! Now, to an expert like Merrill Jenkins (and frankly, many other Americans as well), these new coins without silver were nothing but tokens... government-sanctioned "slugs" issued in place of real money. He had given the government the means to pull off their hoax. To his horror, Merrill Jenkins recalled a day when he was asked by some government officials to demonstrate how his machines worked. At first, they simply tried poor-quality counterfeits. But as his device kept rejecting them, they moved on to higher and higher quality fakes. Amazed at the accuracy and reliability of Jenkins’s machine, they asked him how it was able to tell the difference between silver coins and silver slugs. And even though it was a black-box secret, he told the government exactly how his device worked. It wasn't until years afterwards Jenkins realized why the government had been so interested in his device. Not until the new clad coins were being dumped onto an unsuspecting public. If the government had taken away silver coins without first learning Jenkins’s secrets, they wouldn't have known how to pass them off as legitimate. And if people saw their government-issued coins rejected as counterfeits, the jig would have been up. To the end of his days, Merrill Jenkins felt guilty for inadvertently helping the government force their sanctioned slugs on the American people. So he began researching and studying the entire U.S. monetary system. The more he studied America's money and monetary system, the more Merrill Jenkins came to realize the full scope of the conspiracy behind the counterfeiting of U.S. currency. He discovered the nation's paper money had also been transformed from legitimate currency redeemable for gold and silver, on demand, to mere pieces of paper, redeemable for nothing at all. 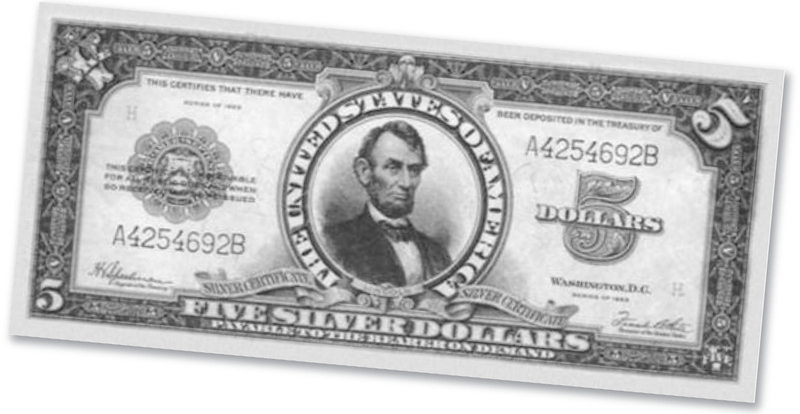 When U.S. paper currency was issued in the form of silver certificates, the $1, $5, $10, and $20 notes were not actually money — they were receipt certificates for silver kept on deposit. And the proof is right there on the face of this note (see dollar below on right) just under Abe Lincoln's portrait: "FIVE SILVER DOLLARS PAYABLE TO THE BEARER ON DEMAND." And the same was true for gold certificates. So long as there was enough silver and gold in reserve to cover the currency in circulation, the entire system worked great. However, the banks didn't keep enough gold and silver in reserve. In other words, they were issuing counterfeit notes. The only legitimate notes were the ones backed by silver or gold. But they just kept cranking out notes whenever they needed them, without concern for whether or not they could be redeemed. Then the Feds made one little change to the paper notes: They removed the words, "will pay to the bearer on demand." Suddenly, the paper currency of the country wasn't redeemable for anything, much less silver or gold. It was just a slip of paper with some ink on it. But the government and banks told everyone, "Don't worry — it's still money." Needless to say, Jenkins was outraged. The American people were being fleeced... their wealth confiscated by the government and banks issuing their currency. Even more outrageous was Jenkins’s discovery that money in America isn't created by the U.S. government — but rather created out of thin air by the banks through accounting entries! Right in the banks' own literature, Jenkins found descriptions of how "money supply" was now irrelevant because a bank loaning money simply creates that money through bookkeeping entries and then deposits it into the account of the borrower. Except, of course, for the interest due on the loan. That money would have to come from money already in circulation — and it was up to the borrower to come up with those dollars. The paper money system in America had become nothing more than a confidence game. One that would eventually collapse like a house of cards. And the Fed not only knew this, but fully expected the jig to be up by the end of the 1970s! In fact, the whole game was played to control YOUR spending! You see, with BOTH the government AND the banks creating money whenever they wanted it, they needed to find some way to control the amount in circulation. And while taxes remove some from circulation, it's not enough. So by loaning newly created money — but not the interest due on the loan — the banks help keep the system afloat. The U.S. dollar is no longer backed by gold or silver — only by the confidence of the people in its ability to be used in commerce. Currency Will Fail and The U.S.
By this time, Merrill Jenkins had become a true scholar of money and monetary history. And so he recognized the fatal flaw in the uncontrolled, unbacked paper notes the banks and the government were now passing off as American currency. The U.S. dollar had become fiat. And history has shown that all fiat currencies invariably lead to inflation... then hyperinflation... and finally complete collapse. Trillions upon trillions of dollars were dumped into circulation by former Treasury Secretary Tim Geithner and former Fed Chairman Ben Bernanke in failed efforts to "stimulate the economy." Yet, each one only served to reduce the purchasing power of those dollars already in your wallet. It's no wonder nations from China to Russia — and even the United Nations itself — have called for the dollar to be replaced as the world's reserve currency. Or why millions of Americans have already given up on the dollar — instead putting their wealth into gold and silver. Unfortunately, what most of them don't realize is that even owning gold and silver may not save you from the impending collapse of the U.S. dollar. Because throughout history U.S. presidents have fabricated reasons to "legally" confiscate gold from American citizens time and again! Merrill Jenkins Made it His Mission in Life to Warn Us About the Currency Conspiracy He Uncovered and How it Would Ultimately Destroy the U.S. Dollar. Merrill Jenkins knew that if nothing was done, millions of Americans would not only have their wealth stolen by their own government, they would also be devastated by the U.S. dollar's eventual collapse. So he embarked on a crusade to educate the public about what he had learned about money... how the government and the banks were counterfeiting it to steal your wealth... and what he saw as a coming monetary upheaval in the world's financial system. He even worked out a solution that would save and restore the U.S. dollar... while returning the wealth to the people from whom it had been quietly stolen by the government and banks. By the time he died in 1979, Jenkins had authored four books on the stark realities of money and finance, including the legendary and now out-of-print Money, the Greatest Hoax on Earth — which has gone for as much as a $1,000 for used copies on Amazon.com. He gave interviews on television, and he took his research directly to the people by regularly giving speeches, workshops and seminars. He shared his sources... answered questions... and basically laid all his cards on the table. Yet, not once did anyone come forward to challenge his conclusions and say, "Mr. Jenkins, you're wrong." Not even the government or banks. Merrill Jenkins may be gone, but his words still ring true today. And it's more important than ever for you to hear the knowledge he shared in his workshops and seminars. Which is why I didn't hesitate when I was offered rights to the recordings of not one, but two long-lost Merrill Jenkins seminars. Digitally remastered and presented on six audio CDs, these seminars offer you the incredible opportunity to experience Merrill Jenkins’s legendary seminars for yourself. ...And far more than I could even begin to list here! of BOTH Merrill Jenkins’s Seminars! What's more, with Money: The Single Greatest Lie In American History, you don't just get the audio CDs; you also receive complete easy-to-read printed transcripts of both seminars in one convenient, spiral-bound book. You don't have to worry about getting lost in the financial terminology Merrill Jenkins uses... because you'll also get a comprehensive glossary of more than 80 terms — each precisely defined by Jenkins himself! Despite what the White House tells us, America's economic situation is getting worse, not better. And the dollar's collapse could come at any time — utterly wiping out the wealth of anyone who hasn't taken the necessary steps to prepare themselves. But this unheard-of offer for Jenkins’s direct words — right now when you need to hear them the most — is not all that makes this offer especially significant for you! Clearly, you CANNOT rely on the government to protect you from the consequences of all this money creation and crisis. It's up to YOU to take the steps necessary to insulate your wealth, savings and future from this disaster. That's why we've created an enhanced and up-to-date Financial Survival Guide based on the principles Merrill Jenkins laid out in his now hard-to-find 1971 exposé. 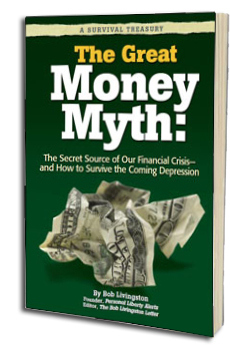 It's called The Great Money Myth: The Secret Source of Our Financial Crisis — and How to Survive the Coming Depression. Not only is this exclusive manual the distillation of Jenkins’s prophetic wisdom — it will help you further understand the "secret" cause of this financial crisis and how it relates to you today! More importantly it will show you the simple steps you need to protect your family and grow wealthier in the days and months to come. American hero... or EVIL SWINDLER? This legendary banker is still admired by many — yet few know how he conspired to control America's money supply... its economy... and the entire future of our nation! Question: The dollar is plummeting... so why isn't the price of gold rising faster? Answer: Because the bureaucrats and greedy bankers are artificially manipulating its price! Why our president is really just a puppet — and who is REALLY pulling the strings! The Great Money Myth: The Secret Source of Our Financial Crisis — and How to Survive the Coming Depression is valued at $199. To receive these FREE gifts valued at $448.95 — all you need to do is subscribe to The Bob Livingston Letter™ for two years for just $69! That's a savings of $49 dollars off the regular subscription rate! Click Here to claim Merril Jenkins’s Financial Survival Package, just for subscribing to my newsletter. And my offer is completely risk-free! If you find my newsletter is not providing information to help you safeguard your health and wealth, preserve your independence, and open your eyes to government deceit in your daily life — you can cancel at any time and receive a full refund. But my FREE gifts are yours to keep! Our Financial Guide, based on the principles in Jenkins’s seminar: The Great Money Myth: The Secret Source of Our Financial Crisis — and How to Survive the Coming Depression — A $199 value! 24 informative issues of The Bob Livingston Letter™ — a $118 value — including mid-month updates via email! But remember, this is a limited-time offer... and our supplies are extremely limited. Order today, , to lock in your subscription because you'll never see this offer again! Without a doubt, America's financial situation is desperate. That's why it's critical you get your hands on Merrill Jenkins’s Financial Survival Package... to hear first-hand not just how we came to the brink, but also how to survive even in a total economic collapse. So don't delay. Subscribe today before it's too late! P.S. Remember if you are not completely satisfied with everything you receive just let me know — up to the very last day of your subscription, 24 full months — and I'll rush you a refund. And best of all, your FREE gifts are yours to keep. You won't find a stronger guarantee, ever! Click Here to say "Yes, Bob start my subscription and send my FREE gifts today!" 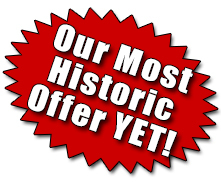 Our Most Historic Offer — EVER! 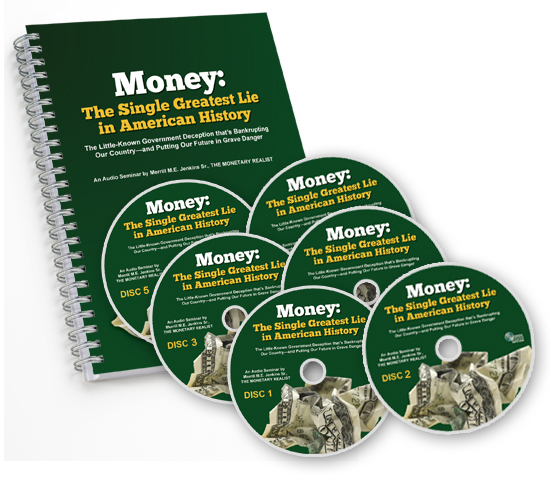 Money: The Single Greatest Lie In American History Seminar Package — a $249.95 value! 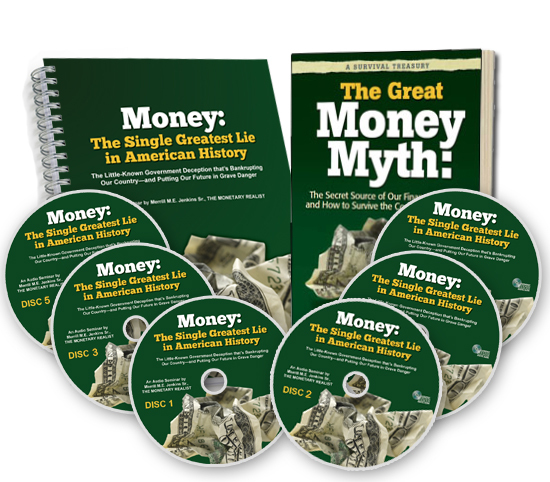 The Great Money Myth: The Secret Source of Our Financial Crisis — and How to Survive the Coming Depression — a $199 value!